So What is the Overall Best In Ground Basketball Hoop? In ground basketball hoops are a great option for anyone that has a flat driveway and that is planning stay at their current residence for many years. Often, in ground basketball systems provide greater stability than their portable counterparts. This produces more accurate and consistent bounce off the rim and backboard. 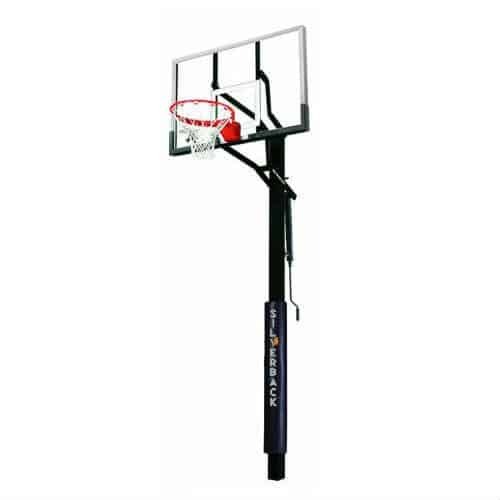 The prices for in ground basketball hoops can vary greatly from under $200 to into the thousands. It is important to select an in ground hoop that meets your price point while having high enough quality to last years of play. Below we have selected three in ground basketball hoops that we feel are of the highest quality. The selections are categorized by price: least expensive, mid range, and high end. This way you will be able to find a great hoop on any budget that will meet your unique basketball needs. 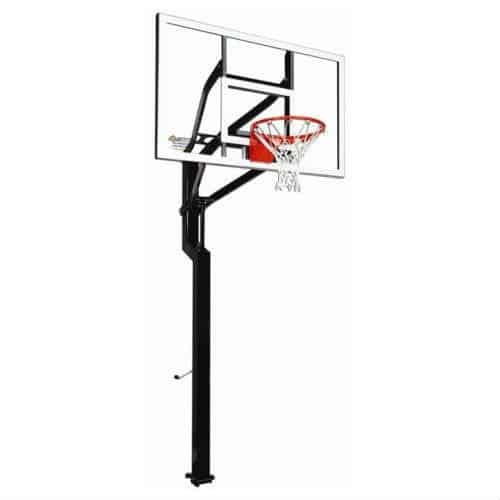 Our first least expensive in ground basketball hoop option is the Lifetime 71799 In-Ground Basketball System. 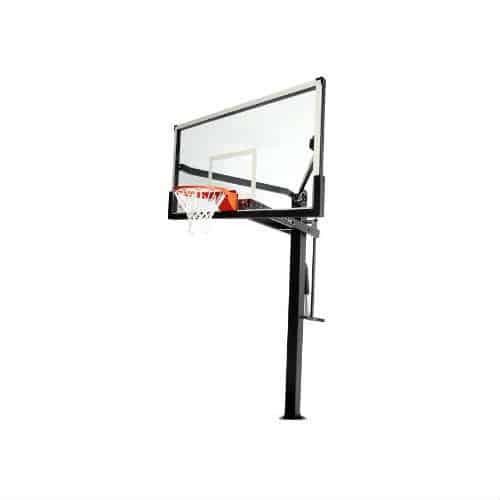 This basketball goal is a great permanent option that features a high quality shatter guard backboard and spring back rim. We like that this hoop is designed for high intensity and outdoor wear as you cannot always predict what punishment your hoop may go through. The height adjustment system allows for dunking and offers younger players the ability to build their skills as they grow. For the money (retails on Amazon for $289.00) we believe you will not find a better value. Spalding is a major player when it comes to basketball and basketball hoop products. 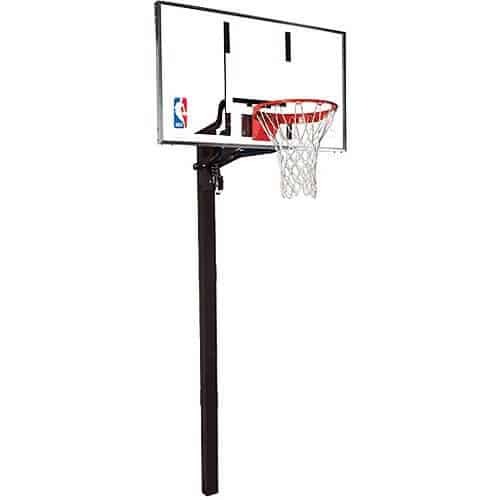 This Spalding NBA In-Ground Basketball Hoop is a value hoop that is targeted to families with young kids looking for a cheap hoop that will offer a lot of fun. 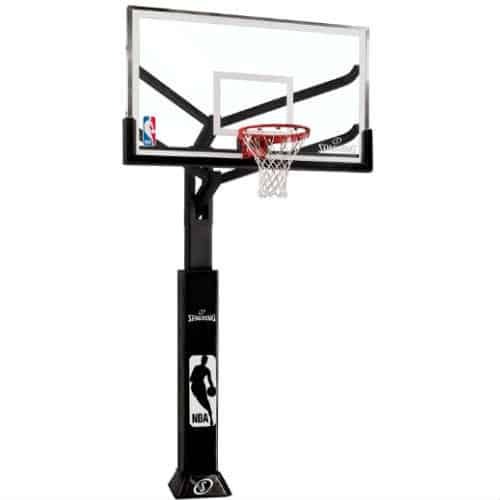 The backboard on the Spalding NBA In-Ground Basketball Hoop is 50 inches and made of polycarbonate. Polycarbonate backboards are known for their durability, but do not offer the responsiveness of higher quality boards. Height on this hoop can be adjusted from 7.5 feet to 10 feet in 6 inch increments using an easy lift mechanism. 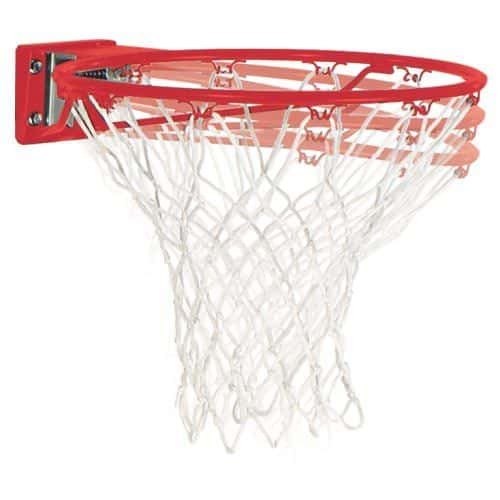 The Pro Slam rim on this basketball system is great for shooting and some light dunking, but do not hang on this rim as it does not offer the durability of higher quality breakaway rims. With typical use this rim will preform adequately. 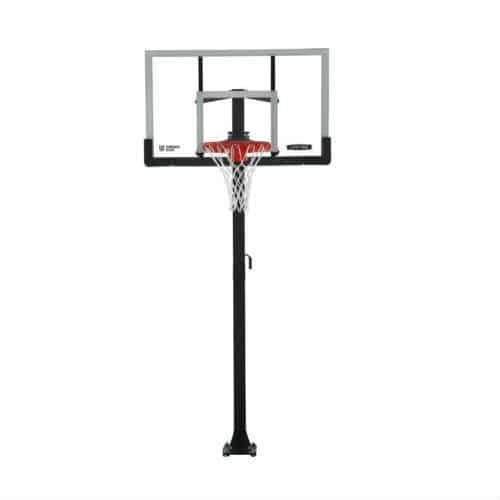 The Lifetime 71281 In-Ground Basketball Hoop is a high quality value hoop that can take on a tough game of basketball between rivals. It features a power-lift pole that is able to adjust the hoop’s height easily anywhere from 7 and a half to the regulation 10 feet. 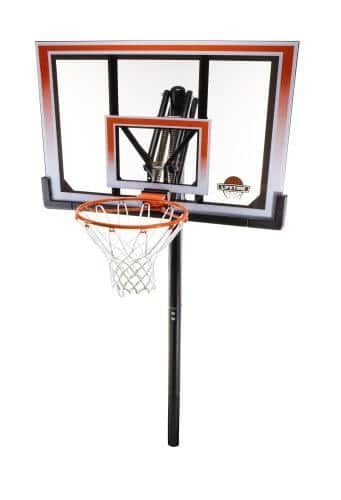 This bad boy also has a double compression rim so that it can take on dunks as well as provide consistent performance on all kinds of shots. This hoop also has a backboard pad to offer extra protection to players. The backboard is 52 inches wide and is made of polycarbonate, which is several times stronger than acrylic. For those who want to spend a little more to get a lot more, the Silverback SB-54iG hoop is a fantastic option. From its appearance alone you can see that this is a pro style basketball hoop. The backboard is 54 inches by 33 inches and made of tempered glass which is the best backboard material money can buy. The backboard gives this hoop a durable and sturdy feel. The pole is weather proofed using Dupont powder coating to ward off rust. Another great feature is the heavy duty padding that wraps around the support pole trunk which enhances safety for any players who may be at risk for running into the pole on a layup or on defense. 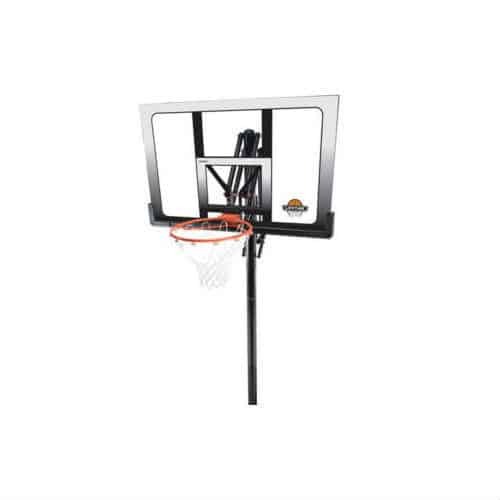 What we love best about this in ground basketball hoop is the pro-style breakaway rim. Whether dunking or shooting, we feel that this hoop will make you feel like you are in the gym using only the best equipment available. A great choice for someone who has the budget and desire for a hoop that takes it to the next level is the Spalding In-Ground Basketball System. 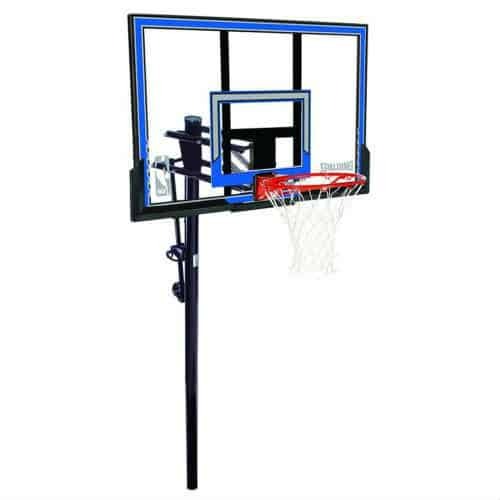 This beautiful unit includes a 60 by 34 inch tempered glass backboard that plays like a professional hoop you see in arenas all over the country. The breakaway rim is also a step above the rims in the less expensive hoop category. 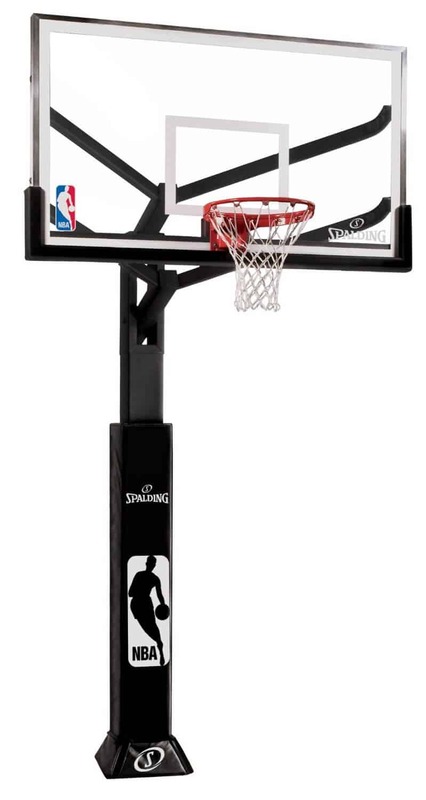 Similar to most modern recreational hoops the Spalding In-Ground Basketball System can be adjusted in height from 7 and a half feet to 10 feet. There is an offset of two feet from pole to hoop to allow for play under the hoop. The square steel pole is of a higher quality than lesser units and will ensure the hoop provides stable and consistent play for many years. It is no wonder that this hoop has earned a 4.3 rating on Amazon.com. 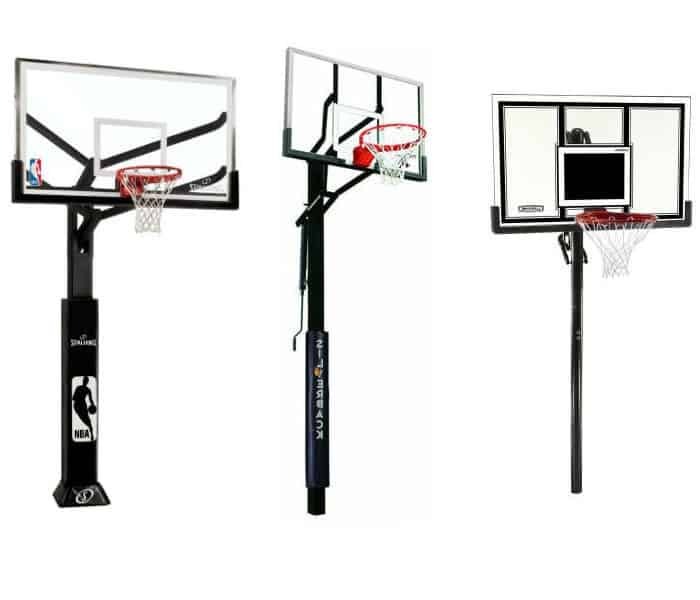 Lifetime has created the Lifetime Crank Adjust In-Ground Basketball System to compete with the likes of Spalding and Silverback in the mid-range in-ground basketball hoop space. The backboard of the Crank Adjust, which comes in 54 inch and 60 inch versions, is a strength. 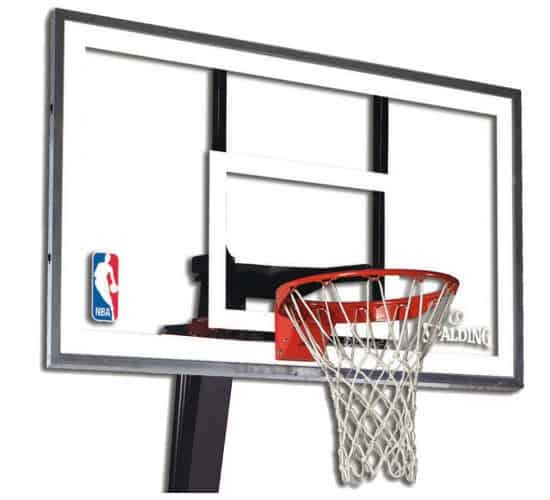 Made from tempered glass, this backboard performs consistently and in a similar fashion to more expensive in-ground basketball systems. The biggest difference being slightly more vibration due to the smaller components on the Lifetime Crank Adjust. The support pole is a 4×4 inch square two-piece, which is mid-range in quality and durability. We like that the Lifetime Crank Adjust has a bolt bracket at the bottom of the support pole which makes leveling the hoop easier. In regard to the rim, it is sufficient, but not quite as durable as the rim found on the Silverback SB In-Ground basketball systems. For the most serious ballers out there who want a high end, top quality in ground hoop, the Goalrilla GLR GS 54 Basketball System is the choice for you. While the hoop is rather expensive ($998.60), it has it so many great characteristics that it actually is a decent value. The backboard is thick tempered glass measuring 54 by 34 inches. For extra stability this hoop comes with rebar steel rods to strengthen the concrete foundation so that the hoop will not move when a shot hits the rim. The rim on this bad boy is also one of the highest quality breakaway rims on the market today. Even if you do not have the flight to slam it down at the regulation ten feet, adjust the height and you can be rim rocking in no time. This hoop is durable, transportable (due to rebar steel rod foundation), and a great option for the most serious driveway legends. Wow, what can we say? Just look at this thing. A hoop does not get more badass than the Goalsetter All-American In-Ground Basketball Hoop. Let’s go over just a few of the features that make this hoop stand out from the crowd. A 60 by 38 inch competition quality tempered glass backboard makes for some of the most consistent play from a recreational hoop. The support pole is a 5 inch square steel piece that can support the abuse from the heaviest of rim rockers. Height adjustment on this unit is a ridiculous 6 feet to the regulation 10 feet. Because of Goalsetter’s patented ground anchor hinge system the hoop can be fully assembled before being raised upright. 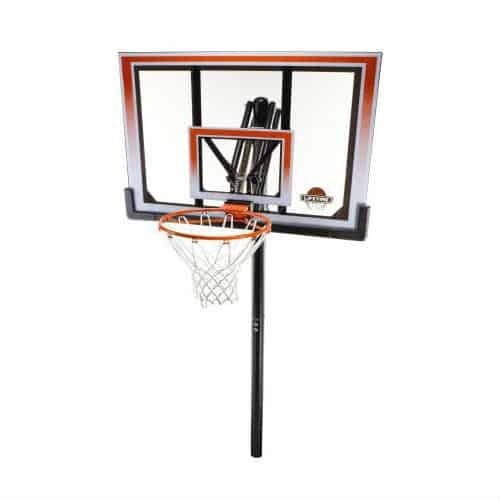 If you are serious about basketball and want to provide the ultimate experience for your home, then get this hoop now! 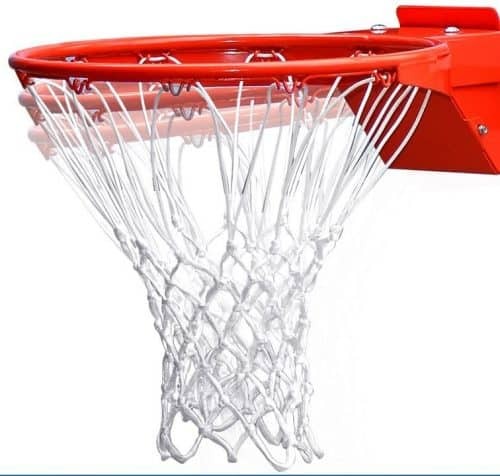 Lifetime not only makes quality low cost portable basketball systems, they also manufacturer the high quality line of in-ground Mammoth basketball hoops. These heavy-duty basketball systems bring the performance of gym quality hoops to your home. The support pole on this rig is 6″x6″ which makes the system very stable. Lifetime Mammoth uses a pump device for height adjustment that ranges from 7.5 feet to 10 feet in infinite increments. 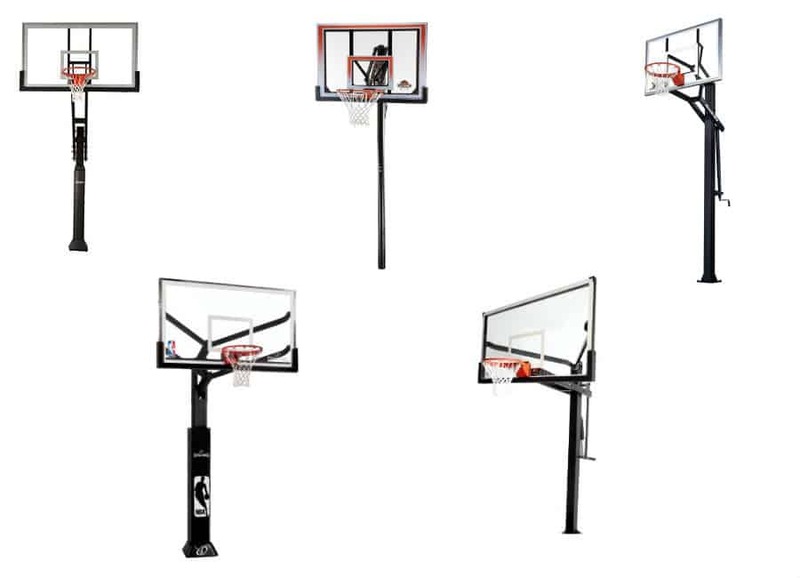 The Lifetime Mammoth Basketball System comes in 54, 60, and 72 inch backboard options. 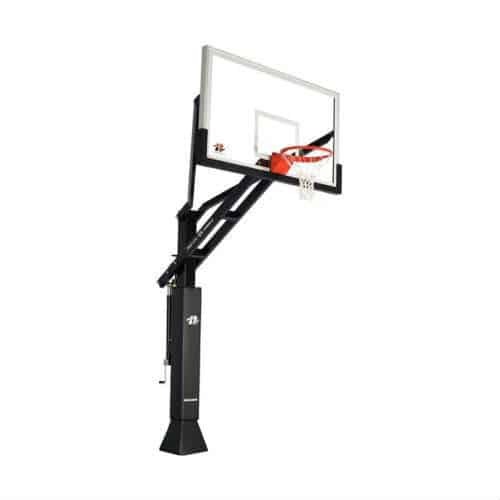 The offset from the rim to the support pole varies from 35″ to 48″ depending on the backboard size option you choose. All backboards of the Lifetime Mammoth are made from tempered glass and comes with backboard padding the lines the bottom and sides of the backboard. We love that this hoop comes with a limited lifetime warranty. With well established brands like Spalding and Lifetime it has to be difficult for a lesser known basketball hoop manufacturer to set themselves apart. Thankfully Ryval appears to have done just that by putting together some of the best quality in ground basketball hoops for sale today. The top of the line C872 model from Rival has a regulation sized 72 inch backboard made of tempered glass, and is a ridiculous 1/2 inch thick! Ryval was also generous when it comes to the extensive heavy-duty padding found on the C872’s support pole and backboard. A four foot offset from hoop to support pole also works to enhance the overall safety of this basketball hoop. Overall, the Ryval C872 has some really special features that can’t be found on other premium in-ground basketball hoops. If you are looking to buy a gym quality system then the C872 has to be on your short list. And here it is, our most expensive, highest quality hoop to make our list. It should be no surprise that this entry comes from Spalding given that they are the official hoop and basketball sponsor of the NBA. 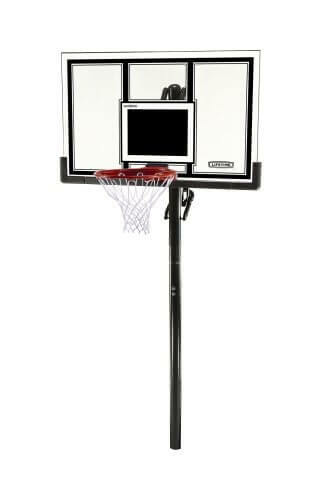 The Spalding Arena View In-Ground Basketball System is by our account the best recreational hoop that money can buy. If you want to feel like a pro while playing at home then this system will make you salivate. There are some extra options with this hoop as it comes in a 60 inch and 72 inch backboard versions. It has a half inch think slab of tempered glass that can withstand practically any shot you could ever imagine throwing at it. Arena style foam padding is fitted to the full length of the bottom part of the backboard, and a professional quality breakaway rim performs as good as anything you will find indoors or out. While this is the most expensive system selected for this list, we believe that this is one of the best in ground basketball hoops you can buy. The first thing that I notice when shooting on a new hoop is how the rim performs. Quality rims have a good feel with the right amount give allowing for consistent bounces. Rims that are too stiff, like double rims found at the playground, don’t allow for any soft bounces. You need to swish every shot or forget about it. On the other hand, cheap rims tend to be too soft and allow for poor shots to go in when they should be misses. There are three basic types of rims that you will find on in-ground basketball hoops: standard rims (no springs), exposed spring breakaway rims, and gym quality breakaway rims. Standard rims are the first modern rim that has been in use for many decades. The design of standard rims generally include a main ring with two less thick arms that attach at the bottom sides of the main ring, with a square that is bolted to the backboard. Components of the standard rim are welded together. These rims were phased out of being used in professional and collegiate levels in the 80’s with the introduction of breakaway rims. These rims have no spring mechanism offering support and bracing for dunks. Because of this, standard rims have a tendency to break and bend over time with regular dunking. We do not recommend dunking on standard rims and strongly advise against hanging on these rims as they may not support your weight. On the plus side, quality standard rims tend to have a good feel. Personally, I’ve always enjoyed the feel of good standard rims, even more than some breakaway rims. How good a standard rim is will depend mostly on the quality of metal used to make the rim. 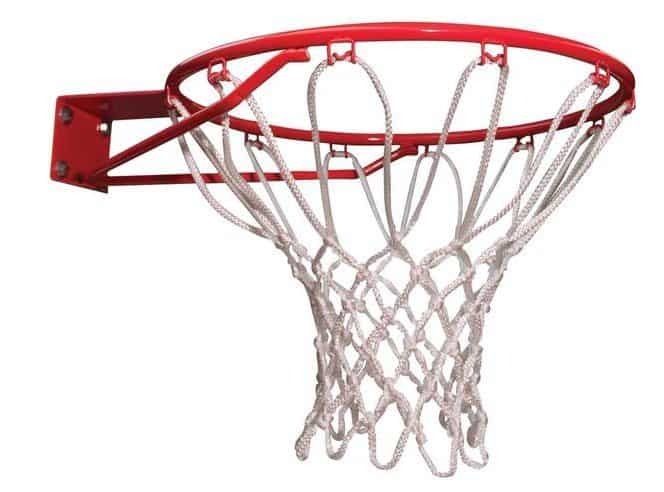 Exposed spring breakaway rims became popular in the mid-90’s showing up on cheaper recreational portable and in-ground basketball hoops as a new feature. I find that poor examples of these rims are worse than standard rims as they are too floppy and don’t actually provide much in terms of enhanced durability for dunking. That being said, these rims have improved over the years and there are now some decent performing models. If you are concerned about getting the most life out of these rims I’d still refrain from dunking. These are the cream of the crop when it comes to rims. Gym quality breakaway rims have at least two heavy-duty springs that are protected by a metal cover. High-end rims like these are found on the most expensive basketball hoops. They offer the best feel and bounce and last for many years thanks to their superior durability. As long as the other components of the basketball hoop are premium quality these rims should be able to take all comers when it comes to throwing down rim rocking dunks. Sizes on backboards for in-ground basketball hoop systems vary based on price and backboard material. 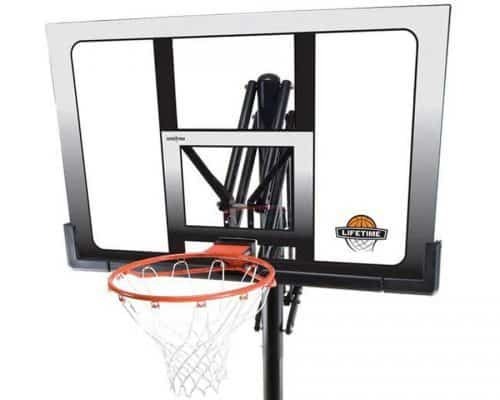 The lowest priced hoop to make our list, the Lifetime 71799, has a 50 inch backboard. At the top end you can find in-ground basketball hoops that have backboards that feature regulation sized 72 inch backboards. Found on low cost in-ground basketball systems, polycarbonate backboards provide great durability and are cheap to manufacture. This makes them great for families, and those who are on a tight budget. The main downside of these backboards is their lack of responsiveness. Most shots off these backboards are deadened by the increased flexion produced by the polycarbonate material. This means they won’t perform in a way that is similar to backboards found in gyms. When it comes to polycarbonate backboards, it is a decision between enhanced durability in exchange for below average performance. A great middle ground when it comes to backboard quality, acrylic backboards offer superior performance than polycarbonate boards without sacrificing much in the way of durability. As with polycarbonate, acrylic backboards won’t offer the performance of tempered glass boards, but they are closer. Basketballs will come off acrylic backboards with some force and will allow you to get meaningful practice on bank shots and rebounding. The best backboards are made from tempered glass. If you require a hoop made from this material be prepared to spend at least $700. Indoor gym basketball hoops have backboards that are made from tempered glass. 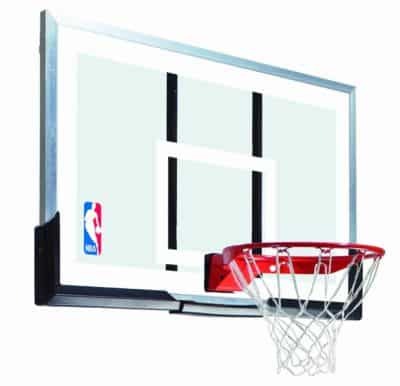 In general, these backboards provide superior game worthy performance in terms of bounce and responsiveness. They do not wobble much when the ball contacts the board and the ball will come off with proper force. The thickness of tempered glass backboards can have a significant impact on its performance, with better performance coming from thicker boards. One thing to keep in mind when it comes to tempered glass backboards is that can shatter due to being made from real glass. They do not offer the durability of acrylic or polycarbonate boards. Because of this it is of the utmost importance that you treat these backboards with care, especially during installation. Support poles are one of the most important, and underrated components of an in-ground basketball hoop. 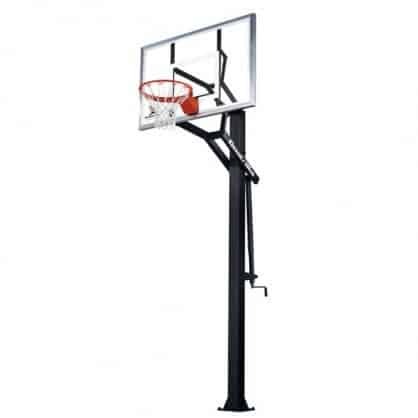 Recreational in-ground basketball hoops have three types of support poles: three-piece, two-piece, and one-piece. Based on their names these support poles designs are pretty self-explanatory. Three-piece poles have three pieces that are attached together to make the support pole. These are the cheapest and least sturdy of the three support pole types. Two-piece poles have support poles made of two distinct pieces. Considered the middle of the road in terms of support poles, two-piece poles offer better stability than their three-piece counterparts. Finally, one-piece poles are the creme de la creme of support poles. 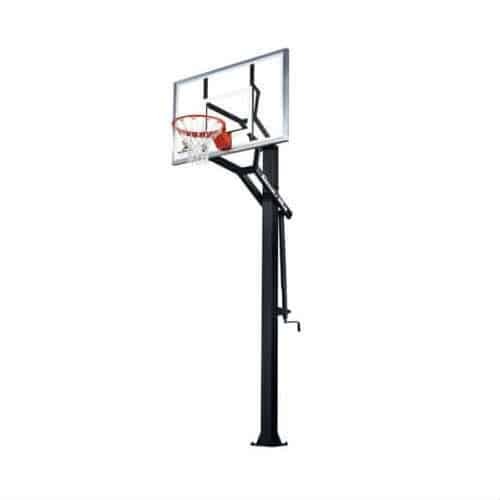 Found on the best performing in-ground basketball hoops, single piece support poles offer superior performance and durability compared to the other support pole designs. Shape and thickness of the support pole is also important. Lower cost systems will have three-piece support poles that are round in shape. The metal will be thinner than that used on higher priced square support poles. Two and one-piece support poles often use square support poles which offer heavy-duty performance. Most of these square support poles will range in dimensions from 4 x 4 inches up to 6 x 6 inches. 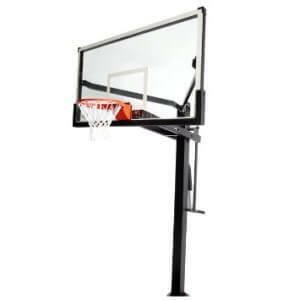 All the in ground basketball systems that we have listed above are great choices for any budget and purpose. Due to this our selection for the best in ground basketball hoop may not perfectly meet your needs like another hoop on the list will. With that said we cannot help but compare each basketball system and see that one stands out above the others in terms of value, quality, durability, and features. For us, the Lifetime Mammoth Height Adjustable In-Ground Basketball Hoop stands above the rest. We absolutely love how robust the support pole is on this hoop. The Lifetime Mammoth is also is relatively easy to install for its size because of its unique design components. The overall build quality is also a step above any of the other hoops we have put on our best in ground basketball hoops list. The support padding is extensive with the Lifetime, and the components in the rim and backboard are second to none. Lifetime has long been a leader in building quality low-cost portable basketball systems, and now has a reputation of putting together great high-end in-ground systems. With the warranty on this hoop you can buy with confidence.